In its decade long journey to be a premium academic institution with focus on Energy, Engineering and Humanities; PDPU has become an institution of national level repute and resonates with innovation, research, contemporary pedagogy, vibrant campus with more than 5000 students. 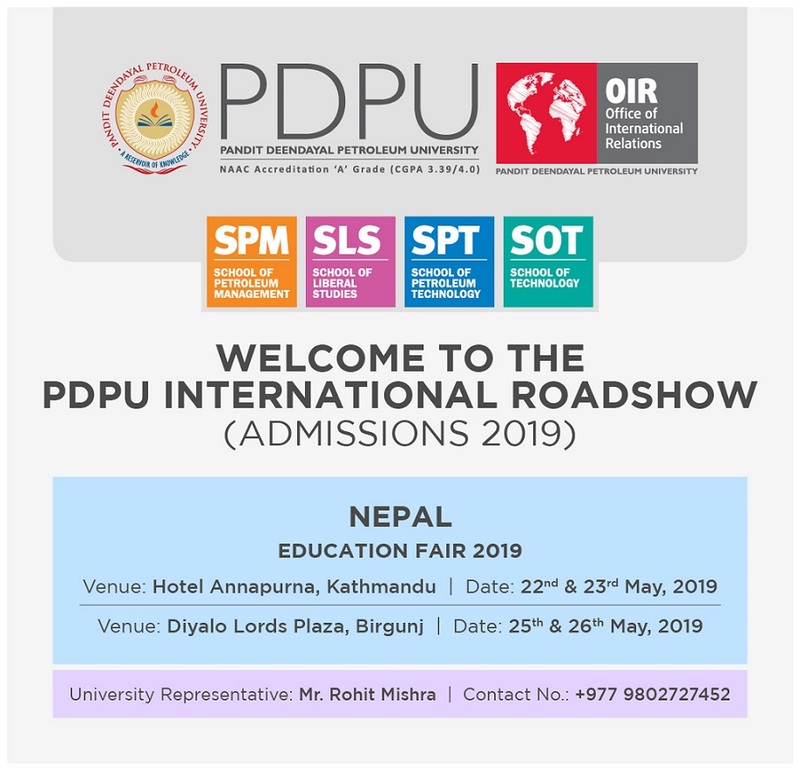 PDPU’s growing reputation has started attracting International students. It has around 60 full time students from more than 10 countries and also hosts more than 200 International Students in programs such as Study in India and AIESEC in each year. Located in the safest city in India makes it even more desirable among International Students. We at PDPU strive to enhance cultural diversity on campus and value its contribution in the learning experience. Ready for PDPU? Here's an overview on what to expect and bring along to make the most out of your stay here! "To Be an Internationally Renowned & Respected Institution Imparting Excellent Education & Training Based Upon The Foundation of Futuristic Research & Innovations"
PanditDeendayal Petroleum University has been promoted by Government, Industry & Energy and Petrochemical Department to create a world class University in energy education and research with special focus on the oil and gas sector. The University addresses the need for trained and specialized human resource in the domains of engineering, management and humanities. Communicating with potential students and parents. Preparing Information material on the University and surrounding community to help International Students. Minimum 45% or its equivalent in the qualifying examination i.e. Senior Secondary [10+2] or equivalent from any system of education as recognized by the Association of Indian Universities (AIU) with English as the medium of instruction. Merit list will be prepared accordingly. All candidates must have full time studied and passed from an academic institution located in abroad with the academic qualifications mentioned for each program in Admission Policy 2018-19 as minimum eligibility conditions, for getting an admission in a respective academic program. Separate application is to be made for each of the program, if a candidate is applying for more than one academic program. To ease the process of loan, it is recommended to go for PDPU's preferred bankers. Nepal Preferrred Banker Nepal SBI Bank Ltd. If you are an International student, it is mandatory for you to attend New to India – Orientation program on the campus. You will be introduced to the culture, academic practices and basic laws of the State of Gujarat. The orientation program is a wonderful opportunity to start making friends. PDPU representatives travel across the globe to bring talents and diversity to the Campus. Keep visiting this place to know if PDPU representatives are visiting your country. Travelers are warned that changing money through unauthorized persons is not only illegal but also involves the risk of receiving counterfeit currency. Please note that no Indian currency whatsoever can be imported or exported, except for Rupee travelers’ cheques. There are 24 hour exchange facilities available in the city and international airport. Credit cards are widely accepted in India, particularly MasterCard, Visa, American Express and Diners Club. Credit cards can also be used to draw cash advances in rupees at various ATM outlets. The electricity in India is in the range of 220/ 250 volts with frequency of 50 Hz through round pin sockets (not flat pin). Bring the appropriate converters.